Standard constructions of garbled circuits provide only static security, meaning the input x is not allowed to depend on the garbled circuit F. But some applications—notably one-time programs (Goldwasser, Kalai, and Rothblum 2008) and secure outsourcing (Gennaro, Gentry, Parno 2010)—need adaptive security, where x may depend on F. We identify gaps in proofs from these papers with regard to adaptive security and suggest the need of a better abstraction boundary. 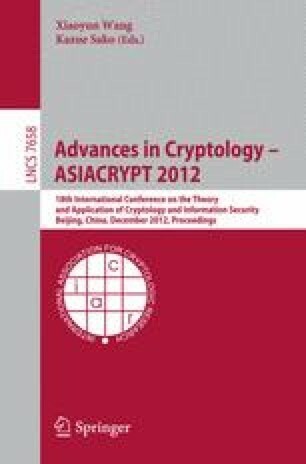 To this end we investigate the adaptive security of garbling schemes, an abstraction of Yao’s garbled-circuit technique that we recently introduced (Bellare, Hoang, Rogaway 2012). Building on that framework, we give definitions encompassing privacy, authenticity, and obliviousness, with either coarse-grained or fine-grained adaptivity. We show how adaptively secure garbling schemes support simple solutions for one-time programs and secure outsourcing, with privacy being the goal in the first case and obliviousness and authenticity the goal in the second. We give transforms that promote static-secure garbling schemes to adaptive-secure ones. Our work advances the thesis that conceptualizing garbling schemes as a first-class cryptographic primitive can simplify, unify, or improve treatments for higher-level protocols.